Just figured while the fishing news is a little slow I would share a catch from a friend of mine last week. Three of them went out on a 27 foot center console. 2 fish filled the back of the boat. Two huh? I'm assuming they had a commercial license. Regulations are pretty strict about bag limit and size slots. None the less, Great Catch. Was this out of OBX or farther south? The one guy does in fact have a commercial license Pickle. My friend was along for the excitement. I certainly would not throw anything out here that would get anyone in trouble. It was right off the OBX JH. Travelled out through Oregon Inlet. Tried to say it "Tactfully". I've seen Oregon Inlet Fishing Center more than once put up pictures of Bottom Fish out of season or exceeding Bag Limits. In addition the size of some Mako Sharks pictured really is questionable. No "Sour Grapes" but just be careful, it can come back to "Kick Ya"
Appreciate it sir! You are absolutely the functional expert on these boards and your knowledge and sharing of such is appreciated! Have a great day and tight lines! Saw a report yesterday, or maybe the day before, out of teach'S lair, a 101" bluefin. Not mine Judy....... A good friends...... I fought and landed a 123 pound Big Eye many years ago..... I want no part of those Giant Bluefin!!! Ha! 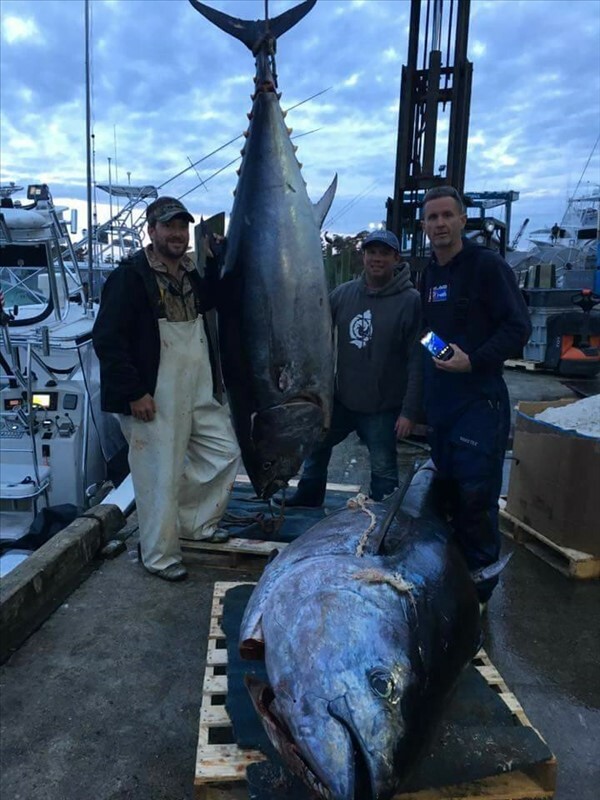 Just for the record, and furthering my prior post, I saw the JudyK post about a 101" Bluefin. For a Recreational or Charter boat you can only keep ONE PER YEAR over 73" Over and Done. You can still keep ONE PER TRIP under 73". 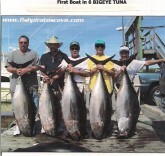 Additionally people ask me can they sell their Bluefin on a charter? The answer is a resounding NO even if the boat has a Commercial License. For Charter or private boats a Bluefin Trip can basically be a Catch and Release trip after the first legal Bluefin is caught. Let's all hope for a fantastic 2017. Yes, as long as they are a recreational or charter boat they are done for 2017. They Can Not Keep another fish over 73" in 2017. All Bluefin have to be "Tagged" with a NMFS tag before being removed from the boat. The data that gets filled out and submitted for that tag is the record of the catch. Now some small boat anglers who just haappen to have a commercial license will say they are fishing commercially. Maybe, but Commercial regulations call for certain equipment on the boat such as a certain class of liferaft, survival suits, commercial permits amongst others. Many times these small boat angelers do not technically qualify as Commercial and stand the chance of fines etc. etc. etc. It gets better. If the Annual Quota (Poundage) is met the fishing can be shut down in a heartbeat. Remember all Bluefin catches must be reported. I mentioned "Slot" sizes earlier. Bluefin is broken down into about 4 size categories and each has separate "Bag" Limits. [ I certainly would not throw anything out here that would get anyone in trouble. It's funny you mentioned that S.D. I was shad fishing in Maryland last year when a DNR LEO stopped us to ask if we saw "this guy". The guy was catching rockfish out of season and posting pictures on Facebook so they were out there hunting him down.. What a nice catch by your friend. We also got into a school of BigEyes a few years ago between 100 & 150lbs. I don't want to fight anything bigger than that. For the next 3 days I couldn't hold a beer with my left hand because it was shaking so much. "For the next 3 days I couldn't hold a beer with my left hand because it was shaking so much." That is a large price to pay to catch a fish.....LOL.....but I get it. Took me about 30 minutes just to be able to straighten my arms completely. Did manage to lift the cooler lid though. My buddy is back out there again today. Reckon he did not learn his lesson last week. Just curious. What'd they do with them? What do you do with fish that size? I know up here some get sold for big money and put immediately on flights to Japan. The guy he went with is a commercial fisherman, so I am assuming he sold them. Part of how he makes his living. My buddy was just there for the experience and to help reel and pull them in the boat.